As I read the news from New York City yesterday, about a grand jury’s decision not to indict the police officer who choked Eric Garner to death, after the coroner ruled Garner’s death a homicide, my chest was tight. I recognized my body’s reaction and reminded myself to breathe. Because I could. Because no one’s hands were around my neck, cutting off the oxygen that these human bodies require to live. And with that thought in mind, it was pretty hard to get rid of the tightness in my chest, the rock in my stomach. As well it should have been. ‘To all you people who think of Mike Brown and say, “just don’t assault a police officer and you won’t die,” I give you Eric Garner. To all you people who think of Eric Garner and say, “just do what the officer tells you and you won’t die,” I give you John Crawford. On Saturday, I participated in a small demonstration at a busy intersection in South St. Louis City. This peaceful action, organized by a local Unitarian church’s “Standing on the Side of Love” group, took place in the same ZIP code where I live: the whitest, wealthiest ZIP code within city limits. At midday on the Saturday following Thanksgiving, this intersection, near a Target, Schnucks, and other retail locations, was hopping. Within minutes of gathering, a woman stopped at a red light told us that we needed to “go back to Ferguson.” She continued to try to engage those in our group, blocking traffic in the right travel lane through at least two light cycles. How dare we bring this issue to her nice, quiet, monochromatic neighborhood?!? How dare we stand there quietly on the sidewalk making her feel uncomfortable? Not long after that, the police swarm began. My friends who were walking to join us saw ten police SUVs speeding down the street with their lights on. Before long, our group of 30 or so demonstrators had attracted an equal number of police vehicles, each vehicle carrying multiple officers, for a likely ratio of 3 [fully armed, riot-gear equipped, zip-tie handcuffs at the ready] police officer to every 1 demonstrator. Oh, and some National Guard thrown in the mix, just for fun. Two officers came over to talk to one of the organizers. I don’t know exactly what was said, but I guess they decided to “let” us stay (on the public sidewalk, where we were breaking no laws), though they had no intention to de-escalate the police presence. It was an interesting ninety minutes. We received a number of friendly honks (as a bicyclist, you get good at discerning these) and waves, but there were certainly nasty looks and comments (shouted from the safety of cars) as well. These, to me, showed that the organizers had picked a good location for this action. We had a single incident of a very riled-up man (red sweatshirt guy) jumping out of his car to confront us. The following minutes were tense. Most of the group wisely chose to not engage, leaving the discussion to a well-prepared organizer. Red sweatshirt guy finally calmed down, and before he left, I overheard a fellow demonstrator sharing his story, his experiences, of being a middle-aged black man, harassed by the police (on multiple occasions) for no reason. Red sweatshirt guy actually seemed to be listening. I have hope that, just maybe, a tiny seed was planted. Face-to-face encounters, where we actually listen are SO important. I’d naively assumed that most of the police that responded had quietly slunk away, but no, they were just one parking lot over. We had to walk right by them. 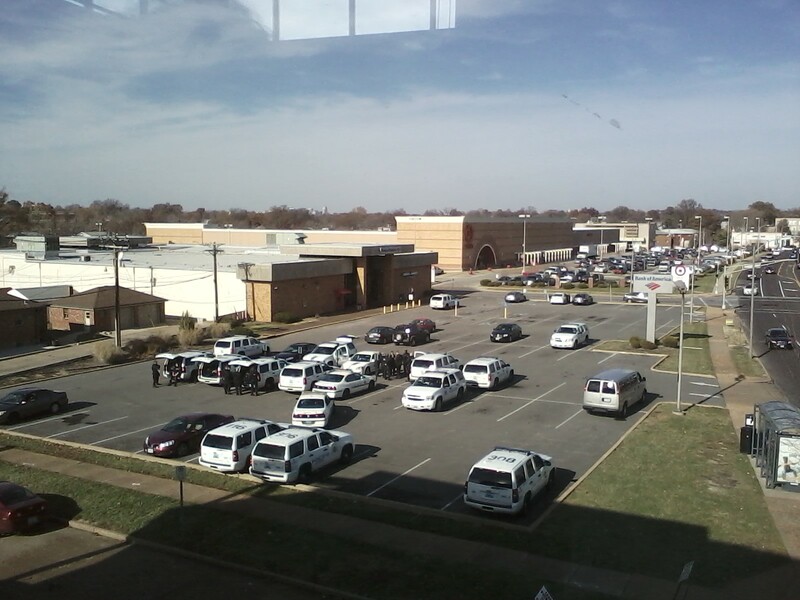 This photo probably shows about half of the police vehicles that responded. The rest were staged across the street in another parking lot, with the National Guard. At the time, I had not yet read about police response to demonstrations after the no indictment decision, including injudicious use of tear gas (a chemical weapon). Amnesty International has sited some specific concerns about police use of force against protestors here, based on reports from their trained, on-the-ground observers. At best, the system is broken. At worst, it’s working as designed. Militarized police acting on decades of inherent racism, wielding weapons against unarmed people with impunity. My chest is tight. But I can still breathe. Unlike Mike Brown, unlike Eric Garner, unlike Tamir Rice, I can still breathe. And so I will continue listening to stories that are hard to hear, will continue to feel uncomfortable with the privilege my skin color confers, will continue to feel sick at the injustices that just. keep. coming. This entry was posted in Uncategorized and tagged BlackLivesMatter, human rights, protests. Bookmark the permalink. I see 18 police vehicles in that picture, and I know I took it after at least ten had driven off, plus the ones across the street, plus the national guard, plus the four vans of sheriffs in the target parking lot, plus the police vehicles that parked in the bank parking lot to the north west of the intersection. I’d actually estimate more of 6 or 8 enforcement officers to each protester. I remember feeling nervous during the first 10 vehicles coming in with their lights on, after that I started laughing a little bit to myself, due somewhat nerves, and a lot due to the absurdity of the situation. What did they think we were about to do that required that buildup of officers? I’m not sure, but I suspect the Sheriff department vans/buses were not full of officers, but instead were there to transport the [zero] people they arrested. Well, I was just sitting down to write a post with the same title. Since I have way more to say on the topic than could possibly fit into a comment I’ll let my post do the talking. But I am so impressed that you participated in that protest, and so disturbed by the police response. I have to say that I’m inclined to agree with Albert Burneko’s assertion that the system is working exactly as designed. The police response was just SO over the top. My first reaction (and that of many with me) was, “Hmm, I guess there’s some really big emergency going on nearby.” And then we slowly realized that, no, this was for US. As long as they were on the tax-payers’ dime (probably overtime), they should have used that ninety minutes for something useful, like mindfulness practice. I forgot to add that, even as a relatively low-key, positive action, it was pretty emotionally draining, at least for me (also didn’t help that I was coming down with a cold that had me down and out for the next 36 hours). The activists who are out there doing this every day, in much more tense situations? I don’t know how they sustain it. I also live in this neighborhood, just down the block and saw the protest. I am curious if you ever considered that maybe the police were there to protect your freedom of speech? The climate in the city has been very hostile and quite honestly not all protest have been nonviolent, although the reports may say otherwise. This particular group was quite friendly and when I saw your group, you werebeing met with a lot more waving and honking than anything negative. I don’t think there were many people waiting to ask if you were “with them” when you left. However, in other parts of the city that same day there were protesters that shut down malls in what they called a peaceful demonstration. I have an elderly mother who doesn’t quite comprehend what’s going on right now but has spent countless hours working tirelessly in her community for underpriveleged people. I say people because I was raised not to see color. She was quite frightened by all of it, the shouting, being forced out of the stores, blocking the roads. To me, and again this is just my opinion, when you are intimidating others, this is no longer peaceful. This doesn’t apply to what I saw your group doing but this is the reason there is a strong police presence and why I am glad there is, to make sure nothing gets out of hand. You speak about their full riot gear. You are a biker, do you bike without a helmet? No that would be dangerous. These men and women have a job to do that could escalate at any moment. Noone knows for sure if the man in the red sweatshirt might pull out a weapon and start shooting. They wear that gear every day, because every day they are putting their life in danger so you can feel safe in your neighborhood. And while I do not agree with police butality, I also think that when a policeman tells someone to stop and lay down, you do it. They have the very dangerous job of keeping peace and order in a very chaotic world. I would never in a million years threaten, punch, fight or resist arrest or expect one of my children to, they have been taught to respect authority. Young black males are not the only ones that are profiled. Growing up my brother was pulled over several times, one time they pulled the seats out of his car and left them on the side of the road looking for drugs. My father had died and my mom was raising us alone. It was late at night and he had to bring the car home like that. Her response was “I hope you were respectful!” “What were You doing that they pulled you over in the first place?” Not how dare they! There is a lack of willingness to take responsibility of the results of one’s own actions.I think the lives of these young men being lost is very tragic, but the tragedy and blame can not be completely placed on the shoulders of the police. It is not a black and white issue, there is a very grey area here. Why when a policeman says put down the gun, even if it’s a toy, would you not put it down? I live down the street from a woman who is raising 3 children, 2 she was pregnant with when her husband, a policeman had his gun taken from him and he was shot and killed,while the man was in handcuffs. I watched many, many policemen and women stand in the streets and be spit at, yelled at, rocks thrown, urine, feces, profanity, and they stood there and took it, to allow the protestors their freedom of speech. It wasn’t until gunshots were fired that they took further action. These brave men and women are the same people that keep this neighborhood safe enough for you to ride your bike to Hampton Village to protest. I understand the need for change but I don’t understand the bashing of all police. I have known many first responders, taught their children and have some in my own family; they are good hardworking, honest people. They don’t deserve this hate and abuse. So when the police stood behind you and the other protestors and allowed you to protest peacefully, kept you safe from the crazy lady yelling at you and the man in the red sweatshirt, why did this so offend you? You should be grateful. And I’m not sure this is the wealthiest area of St. Louis City, maybe, but doubtful. I do an awful lot of work with food and rent assistance through our church and school and there is an abundance of need. While there are several blocks in the “Hills” that are predominately white, most of the area is pretty integrated. Janet, I think I lot of people share your feelings. That is part of why we need to continue to have dialogue. I did *consider* that the police may have been there to protect our freedom of speech, but that was just not the vibe I got. There were two officers within 20 feet of our demonstration, and neither of them bothered to see what was going on when the man in the red sweatshirt confronted us. If protecting our freedom of speech were their intent, a couple of police cars would have sufficed. I understand where you’re coming from with your mother. My mother-in-law is also very upset and confused by the protests. Her particular concern was that she needed to go to a St. Louis county government building in Clayton (time-sensitive matter), and was not sure when it would be safe for her to do so. She has bad hips (both have been replaced and she is facing another replacement) and cannot risk being in a crowd where she might get jostled. But justice actions, including civil disobedience, require some discomfort. 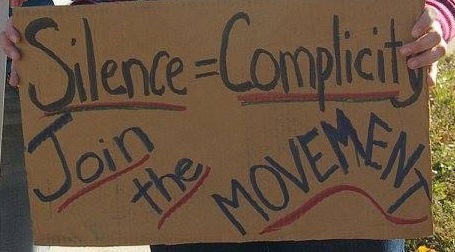 If no one is inconvenienced, what is the impetus for change? Were the civil rights marches and actions in the ’60s convenient and comfortable? Your perception of their purpose and the reality of why they were there are two different things. The police aren’t the bad guys. Again, I ask you can you imagine what our city would be like right now if our police had acted as irrationally as some of the protestors and just walked out and left us all without a force to guard us? Are you denying that there is a criminal element? Are you expecting the police to stand down when a suspect they are trying to apprehend resists arrest and begins to fight back? Are they not to defend themselves? Have you ever been the victim of a violent crime? I think if you had, you’d be grateful when the police arrived! As for the Civil Rights movement, my family’s involvement in fight for equality of all people goes far beyond that. My grandfather ran a construction crew that moved around the country during the 20’s and 30’s and made sure he had as many black men on his crews as white. He got a lot of ridicule for it but he stood firm. Many of the men followed him from job to job. When he finally settled after the depression with a permanent company, he saw to it that all of his crew that stayed with him found work as well. My mother and father continued their work with those who were in need of help to better themselves through work or education and I have tried to do the same, as have my children. Again I don’t see it as a “black” issue because I try to see people as individuals and until we all do this, the racial divide and hurt will never heal. But the change also shouldn’t come at the cost of causing fear in our elderly and children, that is a ridiculous statement. Change is always uncomfortable but it should never cause trauma to the eldery or children. The children losing days in school is truly unnecessary for peaceful change to be made. Involving the United Nations doesn’t impress me much, change in this situation is going to come from a very local personal level. And it has to start with you and me. It has to start with honest conversations about the truth on both sides. As many bad stories of police officers you could find, I could find just as many of them doing great things. The stress they live under is unbelievable and the split second decisions they make I would not want to have to make. Would you? I recently watched “Fruitvale Station”. Very disturbing.